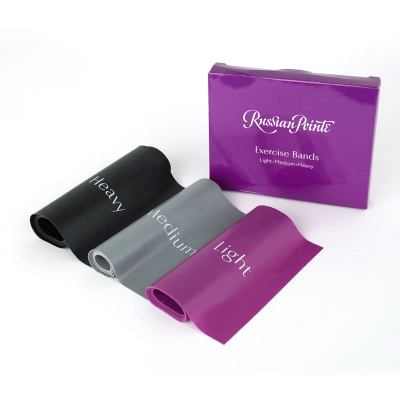 Russian Pointe helps you strengthen and maintain your feet, limbs and core with this nifty set of exercise bands. The set includes three different bands, each designed to provide a different level of exercise: purple for light resistance, grey for medium resistance, and black for strong resistance. Each band is labeled with its resistance level and Russian Pointe logo. With three bands to choose from, you'll always have the one you need to match your strength in the area you are working on. Made of 100% Latex. Each band measures 47" long and 6" wide.